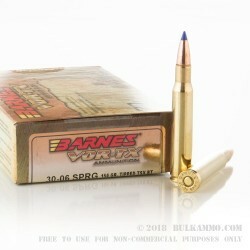 This Barnes VOR-TX TTSX-BT 30-06 ammo is topped with mid-weight 150 grain TTSX-BT copper jacketed lead core Polymer tipped bullets. This famous Barnes polymer tip helps the bullet achieve the maximum diameter possible for its expansion. The VOR-TX line means “Triple Shock- Boat Tail” which is describing the bullet. 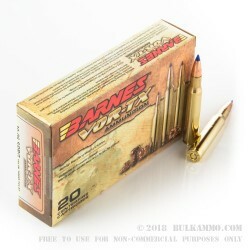 These bullets were designed by Barnes specifically for hunting. These are new manufacture cases that are reloadable, thick walled, heavy duty, highly polished, and feature non-corrosive Boxer primers. These have a muzzle velocity of 2970-feet per second and a muzzle energy of 2937-foot pounds. Its easy to see why these rounds are a top pick of hunters throughout the USA. 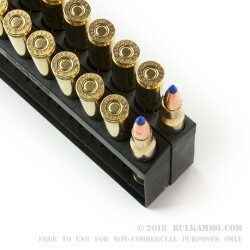 The boxes they come in are loaded with 20 rounds, and are perfectly suited for carrying on the hunt, or for your next family plinking day at the range. Get your 30.06 rounds stocked up now. 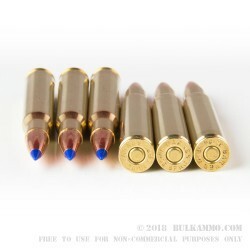 Since 1906, the United States Military has had the 30.06 in service and the round is still used for hunting and target shooting purposes in the civilian world today. Currently, the 30.06 Springfield is still popular cartridge, but it no longer serves the US Military in the M1 Garand or the 1903 Springfield rifle. The 30.06 loading has the specific designation code meaning. The "30" in 30.06 is for the size of the bullet which is .30 caliber. The "06" is the indication that it was developed and pushed into military service in 1906. It is famous for being one of the flattest shooting and most accurate rounds with an extremely long and distinguished service record. Q: Is this ammunition lead free? A: Yes, the Barnes TTSX projectiles used in this ammunition are lead free.